This is Issue Three of Comics Squee. 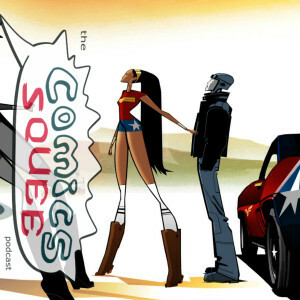 Each month our podcast panelists, squeeing from the Hall of Justice, talk about the comic books, graphic novels, and general sequential art geekery that excites them. I’m your host, Chriss Cornish. Joining me are regular squeesters April Taie and John Oliver. Taking the revolving 4th chair this issue, is our guest Mel Dale, creator of the puppet noir comic book Your Cold Felt Heart. This issue of Comics Squee we’ve got: a suspense comic featuring spies of the mind; an occult tale of the gentleman corpse; a cartoon retelling Wonder Woman’s origin as a ‘70s style spy pulp; and a great comic book movie NOT based on a comic book. 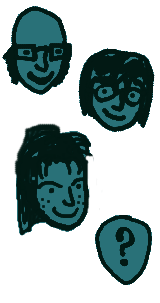 This comic is about an investigative journalist, Maru, and a secret government organization, MIND Management, created to weaponize psychic powers. Mind MGMT is Mel’s favorite book coming out right now. It’s getting him going to his local comic shop each month. The current storyline is about 15 issues in and is being collected in hardcover volumes. They make a great jumping on point for new readers. Volume 2 comes out this September, 2013. Volume 1, The Manager, is already out and collects issues 1 – 6. Volume 2 collects issues 7-12. In volume 1 you meet Maru, the main character. She’s an investigative journalist sent to find out why an entire airline flight got amnesia. This trade also introduces readers to Mind Management, an organization of paranormal spies that can rewrite memories. Volume 2 reveals more about them. 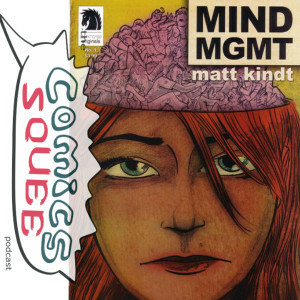 Mel’s not the only one who’s loving Matt Kindt’s Mind Management series. John is also a big fan and has the book on his pull list. He loves how the stories are puzzles and how Matt Kindt is an amazing architect of story and graphic design. Chriss and April are Kindt fans as well, having really enjoyed his art and design work in The Tooth (written by Cullen Bunn and Shawn Lee). Matt has a dreamy watercolor style that’s cartooney but still sort of realistic that’s different from everything else out there. Our panelists basically had a Matt Kindt love fest this issue of the podcast. 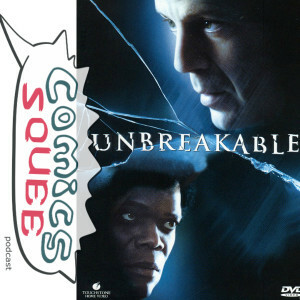 Unbreakable is a M. Night Shyamalan movie from 2000 starring Bruce Willis and Samuel L. Jackson. It’s an original-character superhero origin story and John’s favorite comic book movie. It’s also about a man finding who he is and trying to become the hero his son believes him to be. There’s also a good twist (big surprise with a Shyamalan flick, right). John’s favorite part of the movie, and Mel’s too, is the final conversation at the end between the two main characters about light and dark, and how the characters are Clark Kent and Lex Luthor. Chriss’ favorite part of the movie was when the main character accepts that he has superpowers and is standing in a subway station, letting people brush past him as he uses his powers to feel their motivations. April had never seen Unbreakable, but now she has to add it to her to-see list. Though, given the size of her to-READ list (which we just added Mind Management to) it may be some time before she ever gets to watching the movie. Note that this graphic novel is intended for an adult audience. If you are sensitive to language or mature situations than skip ahead to the 0:31:34 mark where Chriss is talking about DC Nation’s animated Wonder Woman shorts. 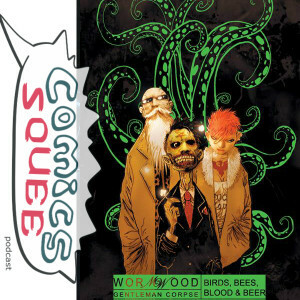 Wormwood Gentleman Corpse: Birds, Bees, Blood and Beer is volume one collecting Ben Templesmith’s occult horror comic. The main characters are: Wormwood, who is a worm riding in a human corpse; Mr. Pendulum, the clockwork drinking buddy/body guard that Wormwood built for himself (looks like ZZ Top) ; Phoebe Phoenix, a bodyguard with an animus tattoo Wormwood hired from his stripper ex-girlfriend. The strippers, by the way, all have magical animal tattoos that animate. And their job is really to guard what’s basically the door sealing The Great Old Ones away. The gist of the plot is that someone wants to summon what’s essentially Cthulhu by destroying the seal in the stripper club. To do this they distribute magical Viagra to the men at the stripper club, but the pills are really eggs for little demon creatures. What’s interesting about Wormwood is that he’s literally a lover not a fighter. He’d rather solve his problems with intelligence rather than violence when possible because it’s messy and not very profitable. Chriss and John had both read Wormwood before and enjoyed it as well. But everyone agreed that though it was a good book, the end felt like a cop out. An “Oops, I’ve run out of pages for this story. The End.” Despite that, it was still a fun ending to the book. Chriss had Wonder Woman underwear as a kid that she would run around in all the time, back in the day. After she’d read the comics, though, she’d always been disjointed with the modern depictions of Wonder Woman. DC’s always been a bit unsure of how to handle the Amazon Princess and have never been able to recapture the fun and adventure of the original run. DC Nation’s animated Wonder Woman shorts, though, do a superb job of depicting the Wonder Woman that Chriss wandered around pretending to be back in the ’80s. These new animated Wonder Woman cartoons on DC Nation are a few minutes each. There are currently three available, and they retell Wonder Woman’s original, World War Two era origin story as a 1970s style pulp spy adventure. For instance, Giganta, a long time Wonder Woman, rises out of the sea to capture Steve Trevor. She steps on two jeeps and uses them as roller skates to chase them down as they escape in Wonder Woman’s flashy ’70s car. Chriss played one of the shorts for everybody and it was described as what would happened if Quentin Tarantino directed an all-ages Wonder Woman story in Grindhouse style. The cartoon’s artwork is in a poster graphic style. Wonder Woman, her sweet ’70s spy car ride (complete with invisible mode), and the landscape are in color. All the other characters, though, are in gray and black. These animated Wonder Woman shorts are written and directed by Robert Valley. And Wonder Woman is voiced by Susan Eisenberg, who voiced the Amazon Princess in the Justice League TV series. Yuji Yata from the Kurosagi Corpse Delivery Service manga (or which Chriss and April are both fans). He wears a sock puppet he claims he can channel a real space alien with. Scarface, a Batman villain. He/it is a ventriloquist dummy who’s/that’s a gangster. Puppet Master, a Fantastic Four villain who makes clay figures of people that allow him to control them like puppets. Handy, from the Tick cartoon (he’s a villain and a hand puppet). The Smiletime muppet of Angel from the Angel comics, which are about a puppet version of Angel and are based on the TV episode of the same name. The Muppets, who have had several successful comic books. This last was vetoed by Mel, who pointed out, quite rightly, that the Muppets are real. Our deepest apologies to Kermit and the gang for mistaking them for puppets. April let us in on the Muppet-centric secret to finding good friends; say, “Mahna na na” to someone and if they respond with, “doo dooo do do do” then they’re a keeper. We took a break to thank our media hosting sponsor, Greta C. While our squeesters were refreshing their parched throats with some water, we played a mini-squee recorded in the fannish wilds. This one was squee-corded at Chriss’ 2013 Read Comics in Public Day Celebration in San Diego and featured Robin Macias, otherwise known as The Silent Q Lurking in Poway, talking about Chew. John: Our Matt Kindt love fest rekindled as John talked excitedly about his plans to read Super Spy: The Lost Dossiers. This one is a masterpiece of interactive storytelling with parts that have to be held up to a light to be read, cut out stereoscopic cards, etc. John is seriously considering buying a second copy to cut up so he can ‘read’ the story the way Matt intended. Mel: Our guest is chomping at the bit to read Darwin Cooke’s next Parker graphic novel. April: Is excited for The Troll King by Swedish creator Kolbeinn Karlsson. A surreal tale that’s the next book for her graphic novel reading group. Chriss: Rocket Girl #1, about a teenage girl who’s a rocket-pack wearing cop from a high-tech future sent back to 1986 to save the world. Chriss supported it on Kickstarter and it’s supposed to come out this Fall.